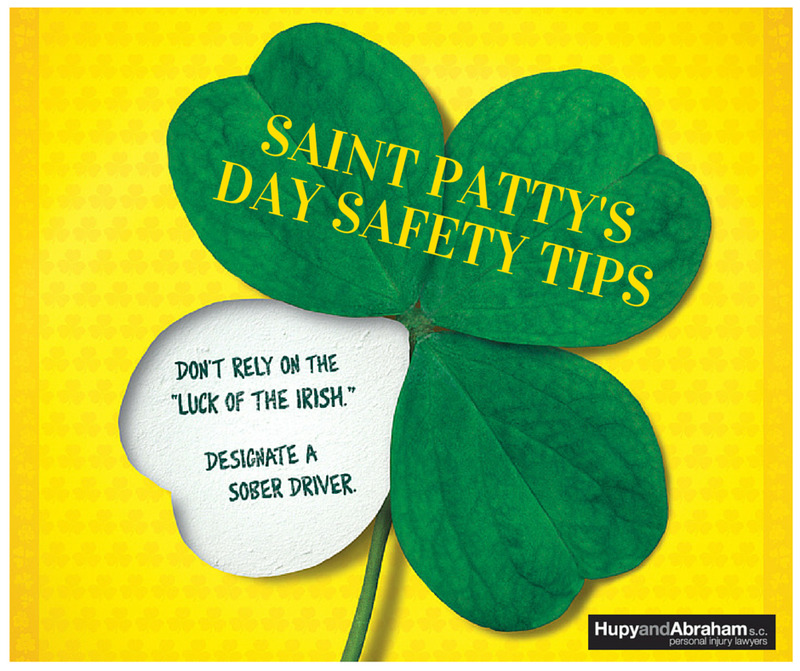 On St. Patrick’s Day, Drive Sober or Get Pulled Over | Hupy and Abraham, S.C.
As one of the country’s most popular holidays, St. Patrick’s Day has long celebrated the roots of 34.2 million Americans with Irish ancestry. But did you know that over St. Patrick’s Day from 2009 to 2013, there were a total of 276 lives lost in drunk-driving crashes? This year, if you plan to celebrate with alcohol, it is important that you don’t drink and drive. Law enforcement fully intends to step up patrolling all day and night in a campaign to crack down on drunk drivers and keep the streets safe for everyone. Tragically, March 17 has become one of the nation’s deadliest holidays. According to the National Highway Traffic Safety Administration, the early hours of March 18 are the worst. In the past, nearly half of all crash fatalities involving drunk drivers occurred between midnight and 5:59 a.m. The average DUI costs about $10,000. In the long run, paying for a taxi is far cheaper. Refusing a sobriety test in many jurisdictions can result in the loss of your license. Drunk driving can also result in jail time, loss of license, higher insurance rates and other unanticipated expenses. Depending on your line of work, you could even be fired for driving under the influence. While we make these requests each major holiday, their importance does not decrease. Repeated public service announcements and campaigns to curb drinking and driving have become necessary in a culture that continues to see this type of reckless behavior as acceptable. Even if you do not drink and drive, we each have a responsibility to our friends, family and communities to speak up when we see unsafe practices. If you know someone who is about to drive drunk or ride with someone who is impaired, help them make other arrangements to get them where they are going safely. If available, utilize a local Sober Ride program. Wisconsin has the Safe Ride program and Hupy and Abraham is a proud sponsor. From 2014 to 2015, WI Safe Ride member establishments provided 85,413 free rides home! Walking home after drinking can also be dangerous. In 2014, 35 percent of the pedestrians killed in crashes had blood alcohol content (BAC) of .08 or higher. If you see someone driving drunk, call 911 and give a description of the vehicle to police. If a friend is drunk and wants to drive, take their keys away. Don’t worry about offending someone -- they’ll thank you later. All of us at Hupy and Abraham hope you have wonderful St. Patrick’s Day celebration and we simply ask that you do so safely. However, in the event that you are injured by the actions of a negligent drunk driver, contact Hupy and Abraham right away. Call 800-800-5678 or start a live chat anytime at Hupy.com.